It feels like a long time since, I did a charity shop haul. I've been trying my best not to purchase, as much. I 've definitely became more discpline. I've always shopped secondhand ever since a friend introduced me to them, where I discovered a wonderful array of treasures and tat for little money. I remember there was always a stigma shopping second hand but it never bothered. Also, thifting meant I could create a goth wardrobe on a budget.as a teenger I had limited money. Now, I aim to get most things second hand all but shoes and electronics (just bad experience). I love charity shops as they tend to be cheaper, I know my money going to help a worth a cause, I never know what I will find and it means less thing is ending up in a landfill. However, I find thrifting can be addictive, and I probably spend money unnecessarily. I 'm trying to curb my spending and prioritising saving. Back in November, I was very good but in December I binged shopped. 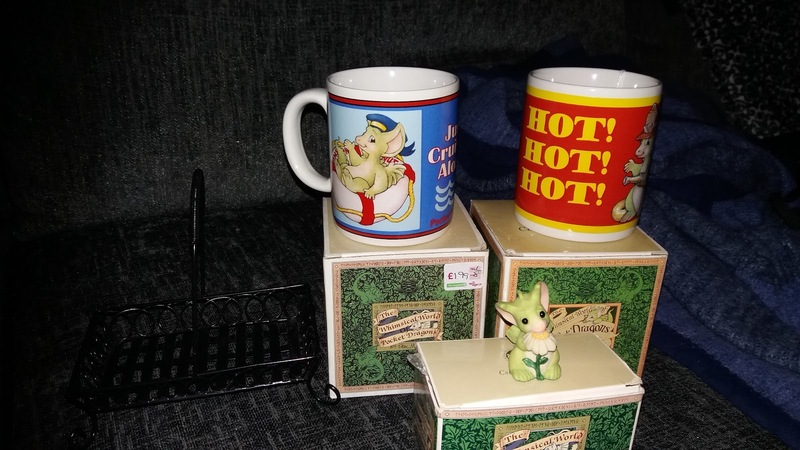 I found some pocket dragons for 99 pence each so score. There was quite a number of these little guys they were in bad condition which was a bit sad. 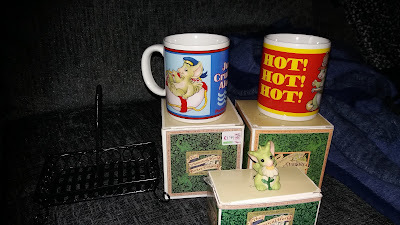 I found more Pocket Dragons the charity shop in a Durham this is a rarity. I tend to find them more like once a year or less. It shows you just never know what one will find. I found these when I went to Morpeth.I put them in the sitting room. 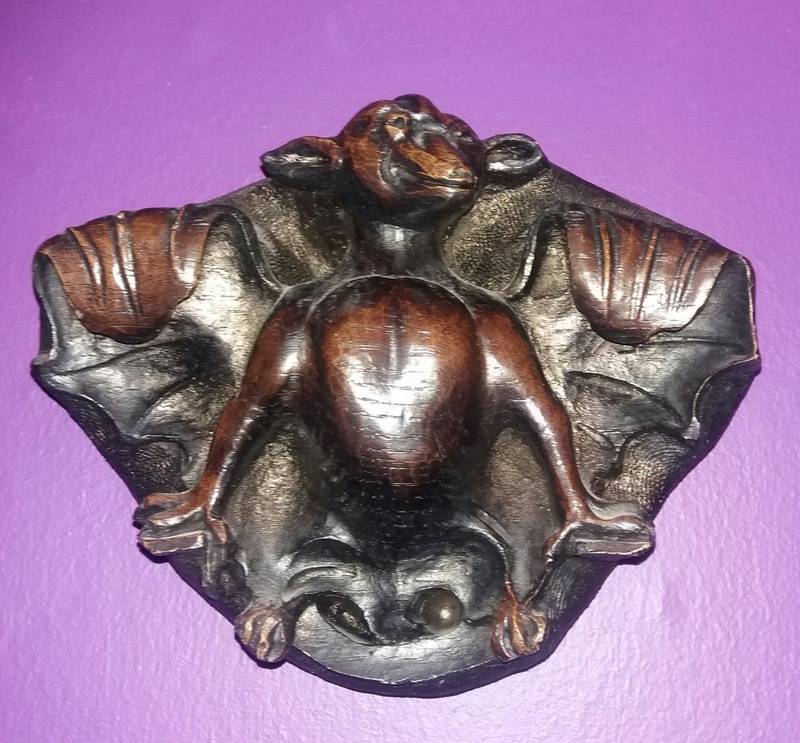 The wall decor is meant to be copies of animals that are carved in Lincoln Cathedral. They were £4 for the pair. I liked the pair, especially the little bat, which compliments my gothic display cabinet. I also found burgundy faux flowers and placed them in my bedroom. I love how realistic the roses look. I found this cat sign that suited my kitchen cat decor . I think it sums what's necessary for life. The book stand keeps my chopping board up against the wall. 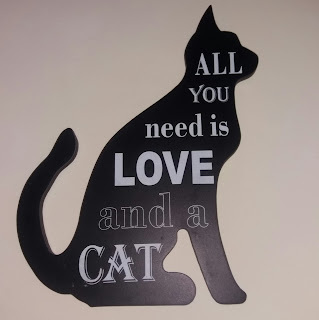 I just couldn't resist the adorable black cat. This is the best bargain of 2017. I wanted a bread bin for ages I saw the exact same one for £12 in B &M Bargains. 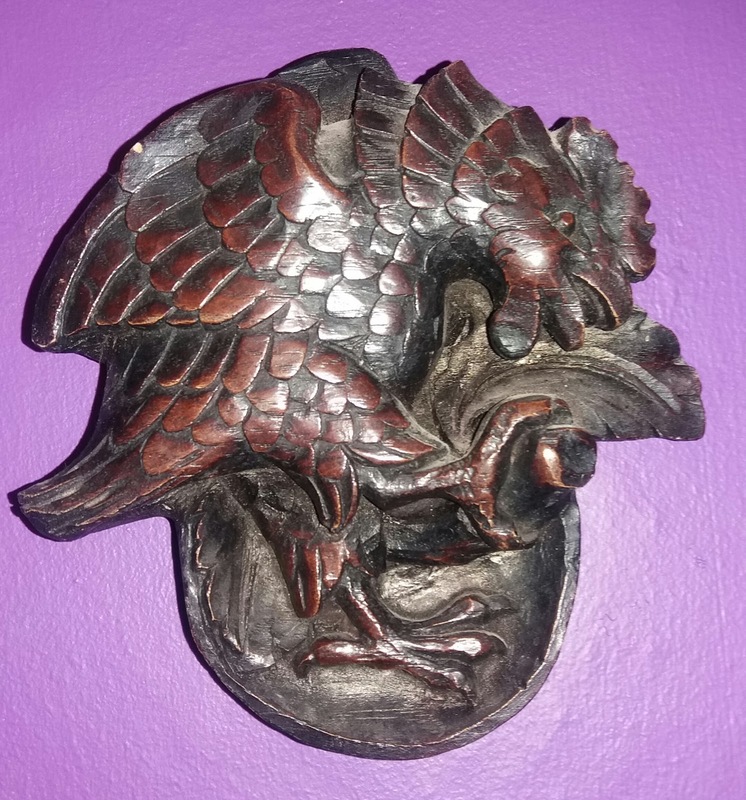 I thought I would hold on I found this one the local community shop; I bartered for 50p, since there some damage at the back, I can't see it. It suits my kitchen decor. I found these in Whitley Bay, when I met up Jane. 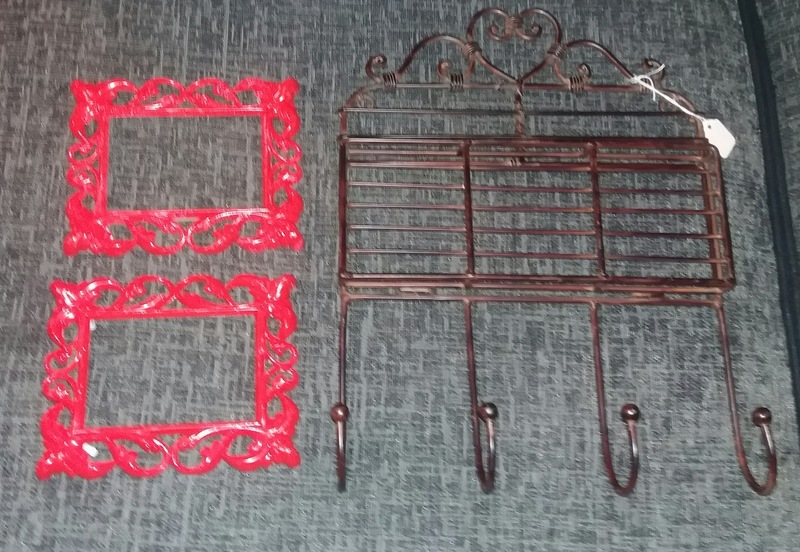 I found two picture frames and a hook and shelves. I'm not sure whether to paint the shelf black but it's going in my bedroom with the frames. I've already spray painted picture frames black, look so much better. 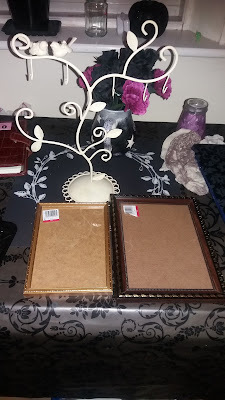 I found these things a couple of picture frames and necklace stand which I've painted gloss black, look much better. This what it looks like painted black. 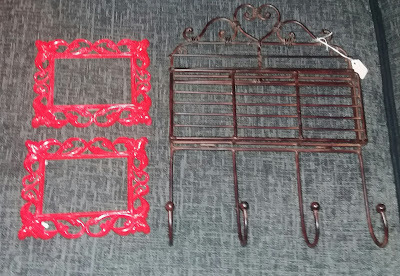 I found another jewellery hanger for a pound and spray painted black. I found this jug vase for more black faux flowers in the hallway. I found the picture frame on sale for 5 pence each and the metal candle think. I not sure whether to remove the metal hoops thing off or find some glass for them. I'm not even sure where to hang it off. I haven't found much in regards to clothes. I'm not sure if I'm getting pickier or the selection of clothes available. I found a ruffle blouse for 99p. The only thing is there is a bit of gape. I think this was the best finds of 2017, its a Per Una skirt love the witchy hem it was half price so it cost £2.25. Thanks.Me to I love seeing what people treasure people have found. The bread box and cat items were real scores! Great finds. That bread box is a real jem. Love the black paint and your style. Shopping second hand is the way to go! Thsnks. I agree second hand is definitely the way forward. I can't believe I found the bread bin I'm glad I did and top is unbelievable. Awesome! I start my new volunteering role soon and realised I have absolutely no clothes suitable for a smart environment after losing weight. I've bought 2 suit jackets (one is Hobbs and immaculate), 2 pinafores, a neat shirt to wear under the pinnies and a grey dress for £25 - all from charity shops. Like you, I don't buy second hand shoes but I have remembered I have a nice pair of lace up patent brogues in the wardrobe. Sorted! I love all your finds, but especially the bread box and that Per Una skirt! Thanks. I definitely think their my two favourite funds of 2017. 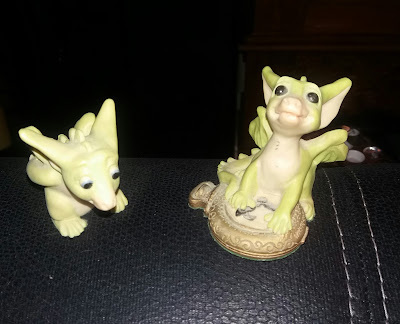 I love my Pocket Dragons I've been collecting since I was 11 or 12 I love them. I'm starting to collect by purchasing a couple of month again. Where I live I'm not too far away from a good selection of second hand shop or charity shops. I'm trying to curb my spending. at the moment. Dragons and gargoyles! You definitely find better things than me! I'm just lucky I think comes down to chance.Or maybe us Brits just love our whimsical creatures. Nice finds! Especially the bread bin (it looks like it's made just for you) and jewellery hangers and roses :) I just love burgundy! Thnaks. I love that shade of burgundy and suits the black perfectly.